Sadly, we have now reached the end of an era as far as MERCC is concerned. It was agreed at the AGM in January 2016 that if we failed to obtain a new venue by the end of the year we would have no option but to wind up the club. I regret to say that, in spite of continued searching, no new venue has been forthcoming. At the recent (last) AGM in February the closure of the club was agreed by members as being the only course of action to be taken and, accordingly, we now have to dispose of the assets. It was unanimously agreed that all monies held by the club once all items of equipment had been sold off are to be donated to charity, the charity or charities to be decided. Much water has run under the bridge in the 32 years that the club has been in existence, and a large number of people will have happy memories. On behalf of MERCC, I should like to thank all those members and non-members who have given the club a great deal of support over the years and had enabled it to survive. Unfortunately, the club was dealt a very severe blow when it was evicted from the Braxted site, from which it was unable to recover. I would like to wish you all the very best for the future, and know that former members will give their support to neighbouring clubs with whom MERCC has always enjoyed a good relationship. Thank you all once again – enjoy your racing! I am very sorry to have to report that today, sadly, the last Annual General Meeting of the club was held. It was agreed at the previous AGM in January 2016 that should a new venue not be found after another year the club would really have no option but to close. Unfortunately, no new venue has been forthcoming and the club is therefore being wound up after 32 years. From its origins as Springfield Buggy Club in 1984, racing at Perryfields School, to off-road racing at Braxted as Mid-Essex Radio Car Club (MERCC) we will have many happy memories. The club has always had a good reputation for its friendliness and the efficient running of its Meetings and will, I am sure, be missed by many – both members and non-members. At the AGM it was agreed that, following disposal of the club’s assets, all monies received would be donated to charity – the charity/charities to be decided in due course. Initially, it is only right that various items of equipment should be offered to members. Following this, remaining items will be offered for sale to other clubs and via the media – watch this space! I should like to thank all those who have supported the club over the years, and a special thank you to those club members (and others) who have always so willingly given their spare time to help in all sorts of ways for the benefit of the club. Also, I should like to thank Southend Radio Control Car Club with whom we have always had a very good working relationship when running the ’Joint Series’ Meetings over many years and I wish them all the very best for the future. It only remains for me to say that, whilst it is the end of an era for us, on the positive side other clubs will benefit from the support given to them by former MERCC members. Long may radio controlled car racing continue! Since my message in early September there has been a bit of a setback with regard to the site that looked promising as a new venue for MERCC. The search is still on-going and, currently, another potential site is being investigated and I will keep you informed about this or any other developments. Sorry I can’t be the bearer of better news at the moment, but I’m always the optimist and am confident that (like the Charles Dickens’ character) “something will turn up”! A special note for 2013 MERCC members; an AGM has been arranged for Saturday, 3rd January 2015 at 9.30 am. Please put this date in your diary! The venue will, as usual, be Springfield Parish Centre. I shall, of course, be contacting members in due course regarding this. Whatever the status of the club at that time, this meeting will be very important and I do hope that there will be a good attendance. In the meantime, please continue to support neighbouring clubs, keep your fingers crossed, and I hope I can let you all have some good news before too long. No doubt you have all been wondering what has been happening since our enforced ‘exodus’ from Braxted early in April! All of our equipment, etc. is in safe storage for the moment, and I should like to thank all those who turned out to help move everything from the Braxted site. I can assure you that we have not remained idle in our search for a new venue. We have received several offers of help but, unfortunately, the venues concerned would not have suited our needs for a variety of reasons but we are very grateful to those who made these offers. Currently we are investigating a site near Chelmsford which hopefully has great potential and could well fulfil our needs. As soon as our investigations have been completed rest assured that you will be kept informed. I know that all of us at MERCC, and many of those who have raced at Braxted in the past, will be keen to get things moving ASAP! Fingers crossed and best wishes to you all. As promised, a message to update you with developments at Braxted. Due to the very wet winter, it had been impossible to get onto the field to do anything until recently. Now that the ground is dry and firm enough arrangements are in hand to have all of our equipment and containers removed from the Braxted site by next weekend. Thank you to those MERCC members who have very kindly offered to help with this, and to a friend of mine who is very kindly helping with the transfer and storage. Everything will be placed in safe storage a few miles away until (hopefully) a new venue is found. The Braxted site is, at present, looking like a building site – what a sad end to an era after many happy years racing there. I know that our members, and many others, are hoping MERCC can start up again and I would like to thank all those who have sent their good wishes. I can assure you that we are doing our best in our search for another site and I will keep you all informed. Being, as always, the Club Optimist I am sure – like the Dickens character Mr. Micawber – that ‘something will turn up’! If any of you know of any land along the A12 corridor which is available and might be suitable as a venue for off-road racing (away from residential areas) – particularly if you know a friendly farmer – I would be very pleased to hear from you. You may or may not have heard about MERCC’s plight at the moment regarding the Braxted venue. Like ‘Chinese Whispers’, reports circulate and often get distorted en route so let me set the record straight once and for all. In a nutshell, we have lost the venue but it is definitely not the end of MERCC! Before I am inundated with e-mails/telephone calls, we are not selling off any of our equipment or track materials! Broadfield Fruit Farm, where the track is (was?! ), originally comprised a series of large fields. Springfield Radio Controlled Car Club, as the club was when it moved from Chelmsford, was fortunate in being able to take over use of the facility from the Colchester Club in the 1990’s. Over the years the MERCC has, apart from holding Club, Series, and Open Meetings, hosted Off-Road Regionals and Nationals and has developed a good reputation for efficiently-run, friendly race meetings. Following the death of the landowner some years ago, some of the land was sold off. In 2010,the son became the owner of the field in which the track was situated. The club had enjoyed a very good relationship with the family over the years and was assured by the son that there were no plans to sell off the rest of the land for the foreseeable future – in short, MERCC’s future for several years at least seemed assured. During late Summer last year, I found out ‘secondhand’ that the field had been sold off without the owner having the courtesy/decency to inform the club. I approached him directly (“Ooh, sorry – meant to tell you” – yes, pull the other leg!) and was assured that the field had been sold – wait for it! – on the understanding that the club would be allowed to continue to use the facility – again, pull the other leg! Shortly before Christmas I spoke to the new owner to ascertain where we stood, and was told that the club would have to find another venue as he had plans for the field. The moral? Be very wary of verbal assurances! You can imagine how we felt being dealt a severe blow like this at the start of the Winter and realising that it is probably going to be March/April at the earliest before we can get onto the field to move our equipment, etc. We had plans for track renovation ready for 2014, and were looking forward to hosting a Regional Round again this year. The club held its AGM on 4th January and, of course, Braxted was the main item on the Agenda. It was agreed that we would not entertain suggestions that had been made by some that MERCC could approach another club in the area with a view to (a) a merger or (b) perhaps using their facilities but rather that we would be patient and wait until a new venue was forthcoming before continuing with racing. Members have already started making enquiries and, being the main club optimist, I am confident that MERCC will – like the Phoenix – rise from the pile of ashes left at the end of 2013 and continue where we left off. The Committee and members will continue to liaise to maintain continuity. In the meantime, I should like to thank all those Committee and Club Members, and non-members, who have helped over the years to make MERCC the successful club it is today. This has meant a lot of hard work, but it has been well worth it. I know I can speak for the vast majority who have raced with us – indoors and outdoors – when I say that our Meetings have been enjoyable. I should also add a big “Thank You” to all the drivers who have supported us and sincerely hope that it won’t be too long before we can start up again. I do know that many of our members will be supporting other clubs in the interim. In conclusion, I wish you all a very Happy New Year and hope you will enjoy your racing during 2014. Our website and Facebook page will continue to be maintained and I will keep you informed of any developments. Any Clairvoyants out there?! 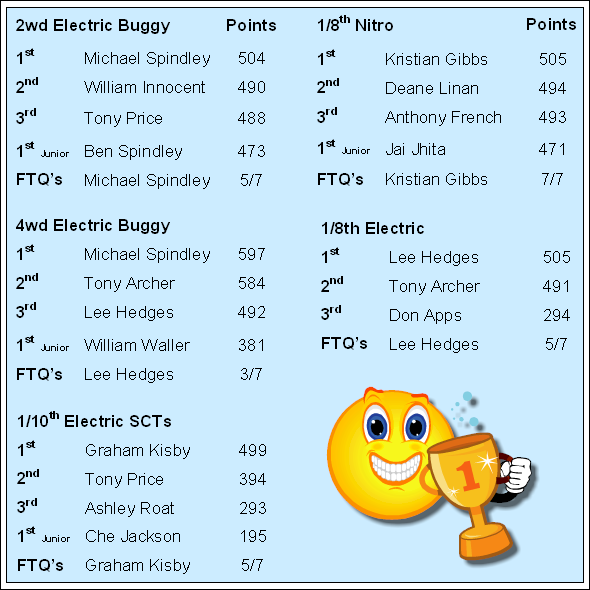 Braxted Off Road Series 2013 Final Standings, with points! Apologies to all those drivers who had been hoping to race at the last two Meetings of our 2013 season. As you know, we were finally beaten by the weather and had to cancel them. Even my perpetual optimism wasn’t enough to save the day! On behalf of MERCC, I would like to thank everyone who supported our Meetings this year (Off Road Series, ‘Opens’ and Regional) and I’m sure you will agree that we have had a great season’s racing, with Meetings being held in a friendly atmosphere. 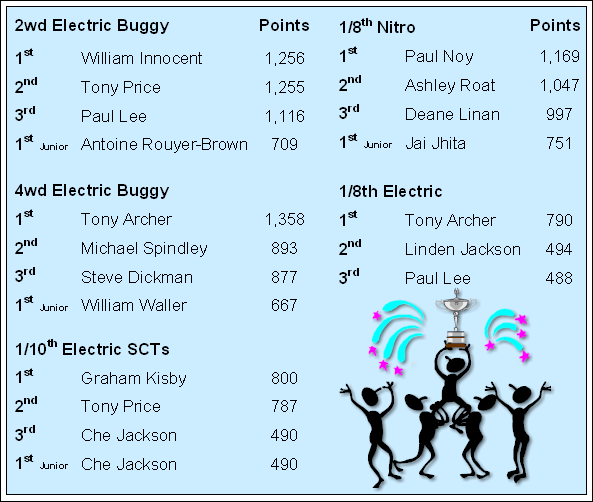 It has been nice to see new members ‘signing up’ with MERCC and encouraging also to have more youngsters racing with us – and beating some of the ‘Oldies’! Plans are in hand for next year and we should have some interesting discussion at our AGM (Saturday 4th January, Springfield Parish Centre, 9.30 am – more details soon). The Braxted Off-Road Series points have been worked out and are being published both on Facebook and on the MERCC website. Congratulations to all the trophy winners and I hope that as many of them as possible will be able to attend our AGM to have their trophies presented to them. If not, the trophies will be given at the earliest opportunity. 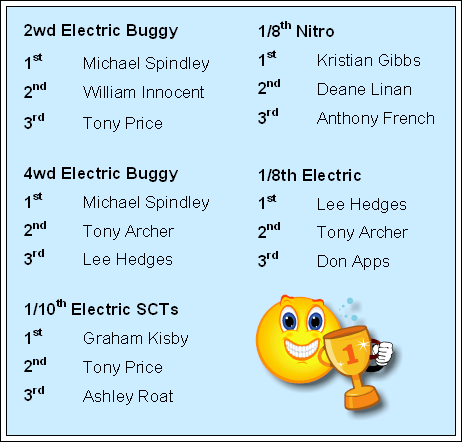 Club Championship points for MERCC members will take into account points from all Meetings held at Braxted this year and will be made available at the AGM, when the winners will receive their trophies. That’s all for now, and we look forward to the 2014 season. In the meantime, enjoy any racing you do during the Winter and my very best wishes to you all for Christmas and the New Year.